This year’s Battle of Stoney Creek was one of the best attended for IMUC. This perennial favourite always brings out our numbers. This year was no exception. 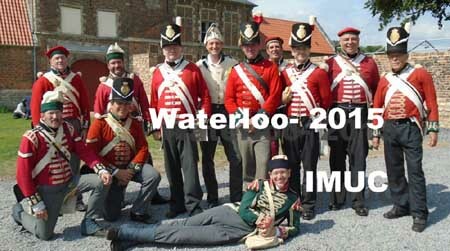 IMUC was called upon to portray US Forces on Saturday and then be in proper Redcoat for Sunday. Our people pulled off both impressions very well! The weather cooperated this year and everyone was able to head home with dry canvas, not something you can always claim! From General Ellis-Jones [Allied Commander Waterloo 200]. This message is to be passed from General Officers to Field Officers from them to Company Officers and from them to their troops and civilian followers. We have all travelled the long road to Waterloo 200. For some the journey has been long in a geographical sense. You have come from New Zealand, Australia, America and Canada. Closer to home you have come from all the countries of Europe. Most of you set out on the road to Waterloo many years ago and I recognize you from Peninsular bi-centennials and battles in the Mediterranean. I stood with some of you during the bi-centennial of the French Revolution in 89 and with a very few of you in the early days of re-enactment during the 1970's. This army is numbered in thousands, with more guns and cavalry than we have ever fielded before. Be proud of that. You have shown the world that, with a willingness to co-operate you can achieve miracles. We have the Army that Wellington commanded. It has been armed and equipped at your own expense. It has been drilled and organized, because that's how you want it to appear. You have given your own free time to make this happen. I should like to thank you all personally. Everyone of you, from the youngest camp-follower to the oldest veteran standing in the line. None of this could happen without you. I have watched this event grow. There are now organizers, coordinators, facilitators, V.I.P's, egotists and more 'administrators' than you'd care to believe. But without you. Without the men and women in the carefully researched and recreated uniforms and costumes, there could be no Waterloo 200. Be very proud of what you have created, because I certainly am. European royals and diplomats have gathered in Belgium to mark the 200th anniversary of the Battle of Waterloo, a turning point for the continent which still touches a nerve and stirs national passions. 'Waterloo, the folly and the grandeur. The horror and the genius. The tragedy and then the hope,' Belgian Prime Minister Charles Michel said in an opening address under leaden skies. France and Germany however sent only their ambassadors to a ceremony that attracted kings and dukes. Michel called for reconciliation through the 'European project' and its promise of peace despite modern-day challenges of conflict on its borders in Ukraine and economic worries. The battle was a pivotal moment in European history, as some 93,000 French troops led by Napoleon fought 125,000 British, German and Belgian-Dutch forces under the Duke of Wellington and Field Marshal Bluecher. Defeat saw Napoleon exiled to Saint Helena in the south Atlantic Ocean, where he died in 1821. The victors redrew the map of a Europe which enjoyed almost a century of relative peace until the carnage of World War I. In London, Prince Charles attended a service at St Paul's Cathedral in full military regalia as a field marshal, accompanied by his wife Camilla. 'This anniversary means a great deal,' said Squadron Sergeant Major Tony Gray, 76, who served with the Light Cavalry. On Wednesday, Charles unveiled a memorial at the Hougoumont Farmhouse, where allied forces fought off repeated French attacks as Napoleon desperately sought to break their lines. French Prime Minister Manuel Valls was ambiguous at best about the ceremonies. 'I heard it said this morning that President (Francois Hollande) and myself should have been there so that we could shed our tears over this fearsome moment for our country,' Valls said. Around 200,000 spectators are expected to make their way to Waterloo, starting with Thursday's commemorative service and ending with battle re-enactments on Friday and Saturday. Belgium's King Philippe led the attendance, which included the Grand-Duke of Luxembourg and the Duke of Kent, the cousin of Queen Elizabeth II, along with Frans Timmermans, the first vice-president of the European Commission. Among those present were descendants of the top commanders on the day - Dutch King Willem-Alexander, whose ancestor the Prince of Orange was wounded at Waterloo; Prince Jean-Christophe Napoleon Bonaparte; Arthur Wellesley, the son of the current Duke of Wellington and Prince Nikolaus Bluecher von Wahlstatt, whose illustrious forerunner led the Prussians who arrived just in time to save the day for the allied forces. The four men placed ribbons of orange, red, black and blue to recall the army standards flown, under a cannon ball and then joined hands in a gesture of reconciliation. 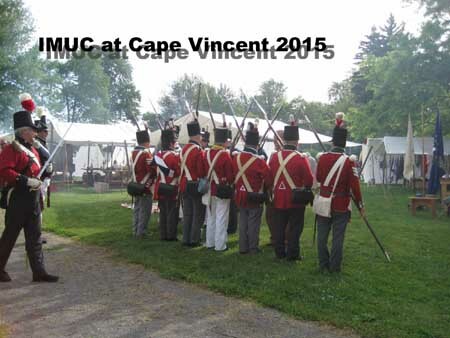 Along with the Voltigeurs from Montreal & a lone Canadian Fensiblefrom Ottawa , IMUC took on the Town of Cape Vincent this weekend and their local military and militia defenders! The Faire Jeanne was in port and helped with the attack and the landing! The Owl, The Pathfinder and the St Lawrence II were also in port! The weekend got off to a great start with the weather cooperating beautifully. A tad cool for June, but definitely nice “wool weather”! All went well until the weather changed and the pirates arrived! Bad weather and pirates never lead to anything good! We would like to thank our hosts (Mike Chavoustie and the town of Cape Vincent) for such a warm welcome and reception! Cape Vincent is a great little 1812 event and we hope they invite us back!